Contemporary design and stunning waterfront views, our Cape Breton hotel rooms and suites are the perfect combination of value and comfort. Pack your bags and begin your Nova Scotia adventure today. Friendly service, modern rooms and a personal touch are just the beginning. Enjoy the use of the onsite facilities like free wireless high speed internet access and onsite dining designed to make you feel at home before retiring to your accommodations. And while the features are great, it’s the views and coastal scenery that steal the show. The Holiday Inn Sydney Waterfront is made up of 152 guest rooms and suites. There’s something for everyone here whether you’re here with family, on business or a group. 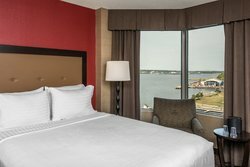 With the promise of a good night’s sleep ahead, you can unwind during you visit to Sydney, Nova Scotia and leave the hard stuff to us. 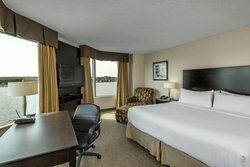 Our Two Queen Beds guest rooms are outfitted with 2 Queen Beds in triple sheeting and are a great flexible place to stay with groups or families. 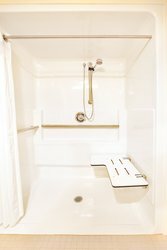 En suite facilities like your own bathroom give you the privacy you want while access to complimentary in-room internet connection means you can be as connected to the outside world as you want. En suite facilities like your own bathroom give you the privacy you want while access to complimentary in-room internet connection means you can be as connected to the outside world as you want. Step out of your ordinary day-to-day and step into your One Queen Bed Guest Room at the Holiday Inn Sydney Waterfront to begin your East Coast excursion. 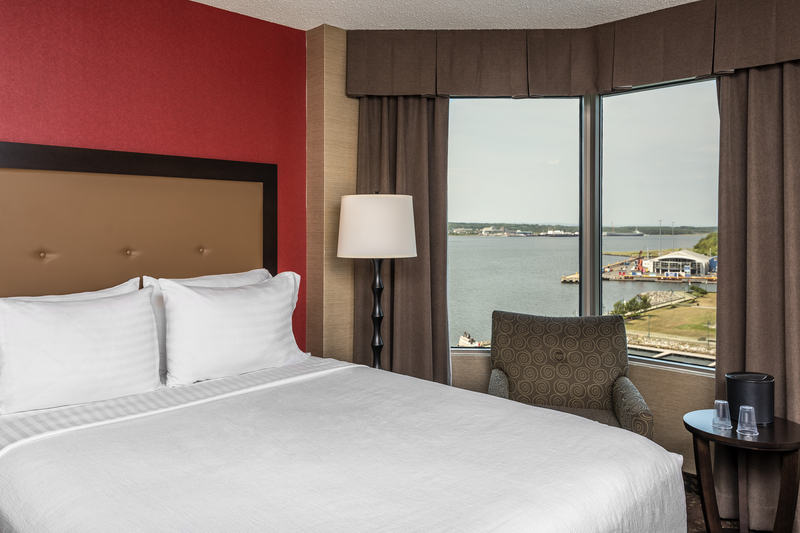 Experience extraordinary when you stay in our guest rooms where guests will enjoy access to waterfront views and wireless internet access. No matter what your notion of comfort is, we have what it takes to accommodate you here at the Holiday Inn Sydney Waterfront. There’s also no need to sacrifice comfort for value when looking for a place to stay in Nova Scotia. One King Bed guest rooms consist of one King size bed with triple sheeting and all the great amenities you’ve come to know at love at a Holiday Inn like an in-room mini fridge. With all the same great features as our guest rooms, the King Executive is all the extra space you need and the great extra amenities you want while staying at our Holiday Inn Sydney Waterfront. Made up of a private bedroom and separate living space, our family-friendly, business traveler-friendly Executive Room also has a second half bath off the living room along with pull out sofa, microwave and a fridge. 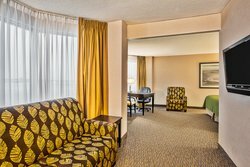 With all the same great features as our guest rooms, the King Executive is all the extra space you need and the great extra amenities you want while staying at our Holiday Inn Sydney Waterfront. 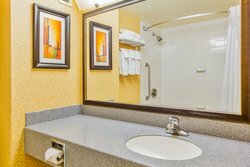 Made up of a private bedroom and separate living space, our family-friendly, business traveler-friendly Executive Room also has a second half bath off the living room. The King Suite is all the extra space you need and the great features you want in your East Coast holiday. 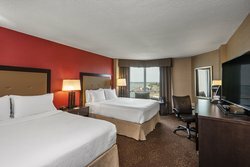 Made up of 2 distinct rooms, our family-friendly guest accommodations include 1 King Bed with plush bedding with a whole host of features including internet access, access to our onsite dining and complimentary bathroom features. The room also features a wet bar, 1.5 bathrooms, a pull out sofa, fridge and microwave. The King Suite is all the extra space you need and the great features you want in your East Coast holiday. 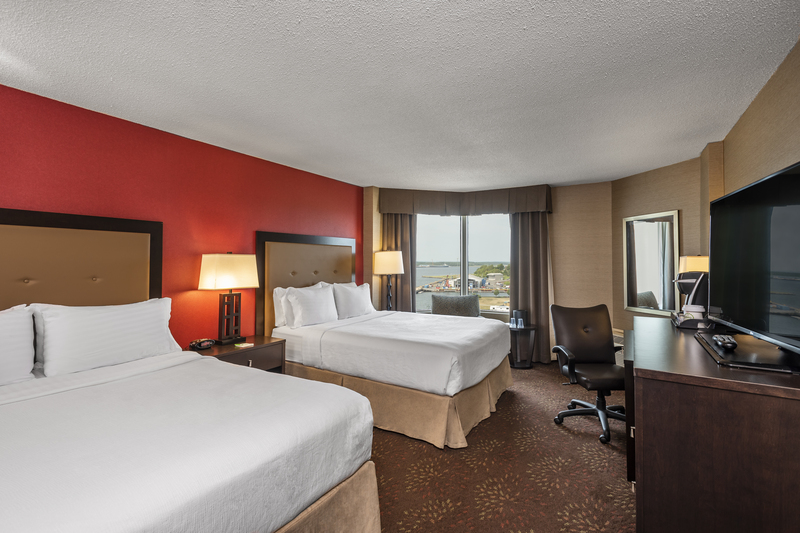 Made up of 2 distinct rooms, our family-friendly guest accommodations include 1 King Bed with plush bedding with a whole host of features including internet access, access to our onsite dining and complimentary bathroom features. 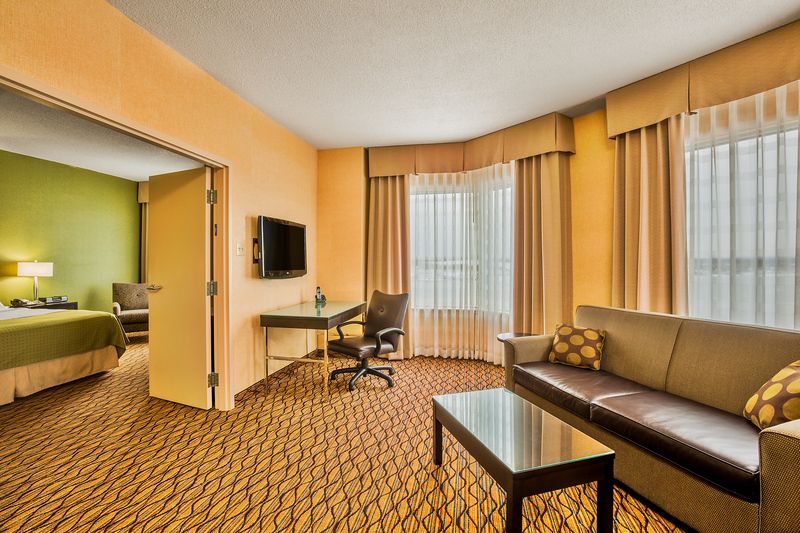 Stay in style when you choose the King View guest room. 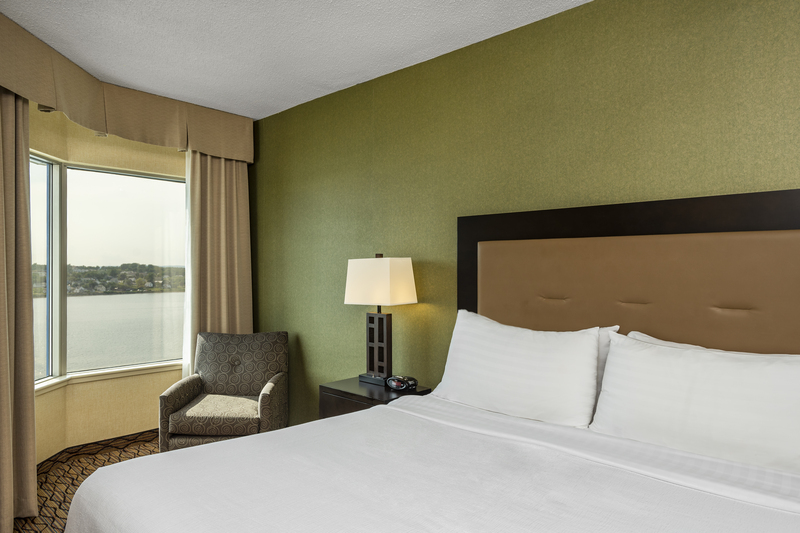 A large layout, stunning water views and plush bedding make it a comfortable place to spend your time when staying at the Holiday Inn Sydney Waterfront. No matter how you define comfort, there's a room for everyone at the Holiday Inn Sydney Waterfront. 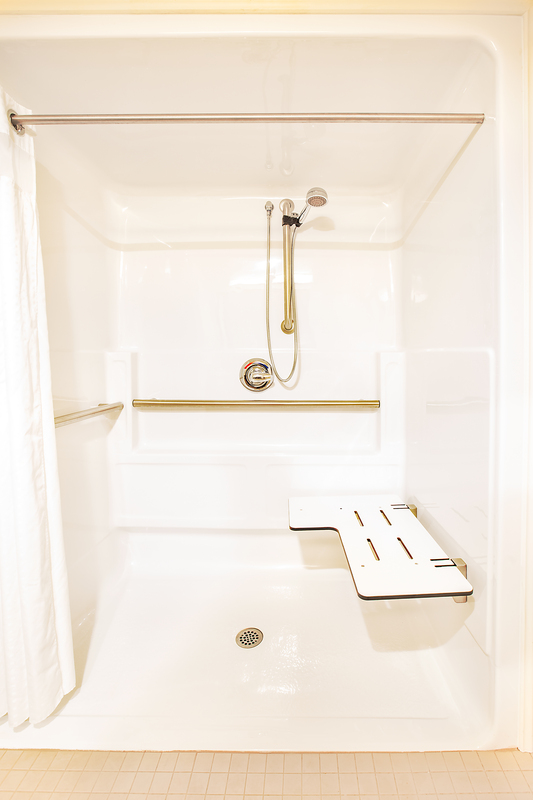 At the Holiday Inn Sydney Waterfront we provide ADA Accessible features like guest rooms with roll-in showers and grab bars.